The Citizen Eco-Drive Super Tough timepiece is made to battle all elements with its weather proof design, shock resistant materials and extreme temperature resistance (-10c to +60c). It is also anti-magnetic, ISO-compliant and is water resistant to 300 metres. Featured with a Super Titanium™ case, blue kevlar strap and bold blue dial. 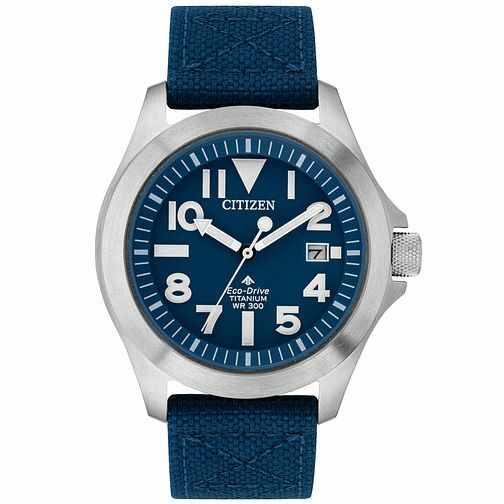 Featuring Citizen's award-winning Eco-Drive technology which harnesses both natural and artificial light and converts it into energy to power the watch, a watch that never needs a battery.